The Electric Human is a collaborative effort of Jimmie Holman, Pulsed Technologies Research and Dr. Steve Haltiwanger, MD, CCN. 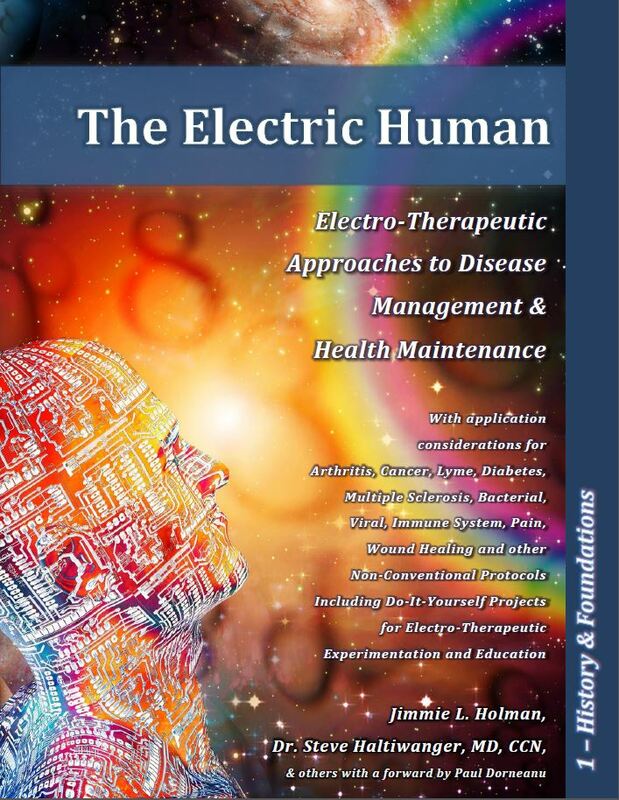 The Electric Human simplifies and demystifies electro-therapeutic approaches to disease management & health maintenance in a manner practitioner and layperson alike can easily understand. The draft of Part 1 – History & Foundations is provided here to give the reader an abbreviated overview of the technology, history, and even the politics which have been the source much of the confusion and limitations we live with today. By more fully understanding these concepts and history, the reader can better strategize how these technologies can better be incorporated into their personal daily lives and give themselves the knowledge that better or more viable alternatives exist in times of crisis and unique needs. This is an ongoing work in progress. It has not yet been determined how or when the more technical chapters will be released or in what media although it will most likely be in e-book or electronic form. We will notify those interested here within this forum as additions become available.